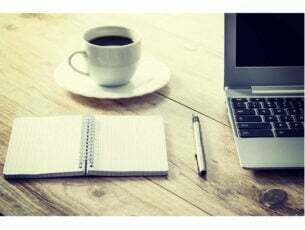 With Windows as the most popular computer operating system in the world, it’s not surprising that users of products not manufactured by Microsoft still use Windows PCs as their every day workstations. For example, Apple’s iPhone has hundreds of millions of users worldwide, but a decent segment of them prefer using Windows computers over macOS. There are many multi-platform apps that function on both Windows and iOS. However, the integration between the two operating systems is still not that great — which comes as no surprise, knowing about Microsoft’s and Apple’s rivalry. Because of that, we often need to connect two devices to be able to use certain apps. 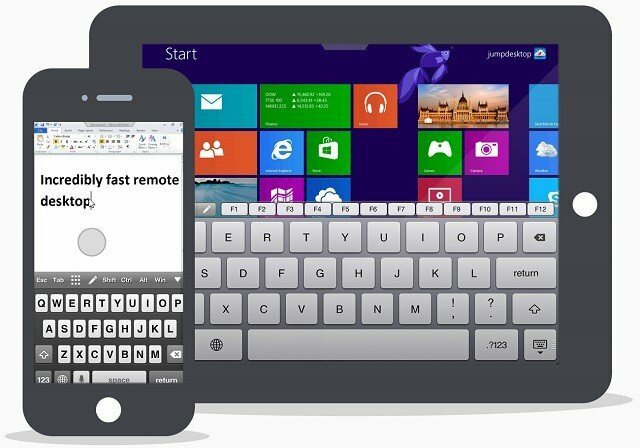 And what’s the better way to connect a Windows computer with an iPhone than using a remote controller app. 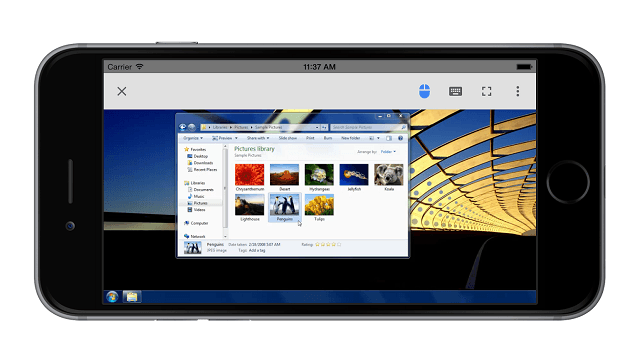 In that manner, we created the list of the best iPhone apps for remotely controlling your Windows PC. The apps are different, so we think they’ll satisfy everyone’s needs. 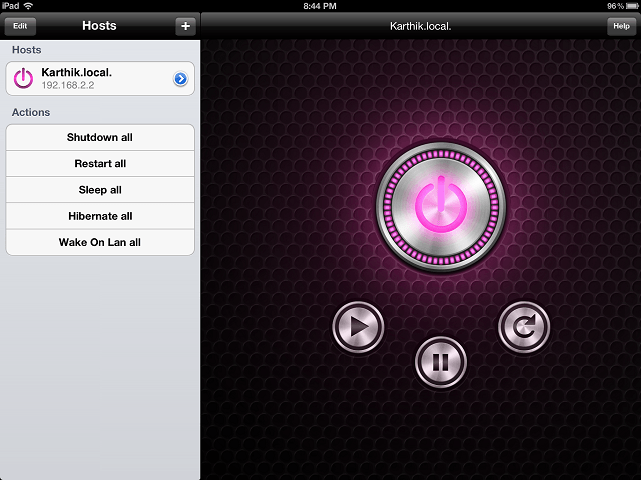 Remote HD is a great all-around app for remotely controlling a PC using an iPhone. Actually, it’s not just limited to PC, as users can also control Macs and an Apple TV. Remote HD has everything you’d expect from a remote control app. You can easily live stream your computer screen to see what’s going on. Also, this app simulates a mouse and keyboard, an effective way of controlling your computer. One of the biggest advantages of Remote HD is that it connects using GPRS, EDGE or 3G. That way, you’ll be able to monitor and control your computer while you’re outdoors. The app has even more features for controlling Apple’s products, but that’s not our focus in this article. Remote HD is available in the Apple Store for $7.99. In case you didn’t know, Google’s Chrome Remote Desktop has an iOS version, as well. And it’s pretty good. The app basically works the same way it does on Android. All you have to do is to download it on your iPhone and install the Chrome Extension on your PC. Once you install the Chrome extension, connect it with your iPhone and you’ll be able to control your PC. The app projects your PC screen on your iPhone or iPad, so you can easily navigate through it. The only requirement for this app to work is having Google Chrome with the Remote Desktop extension installed on your computer. Don’t worry: Even though Chrome is required, you can control everything with this app and not just the browser. Chrome Remote Desktop is available for free in the Apple Store. 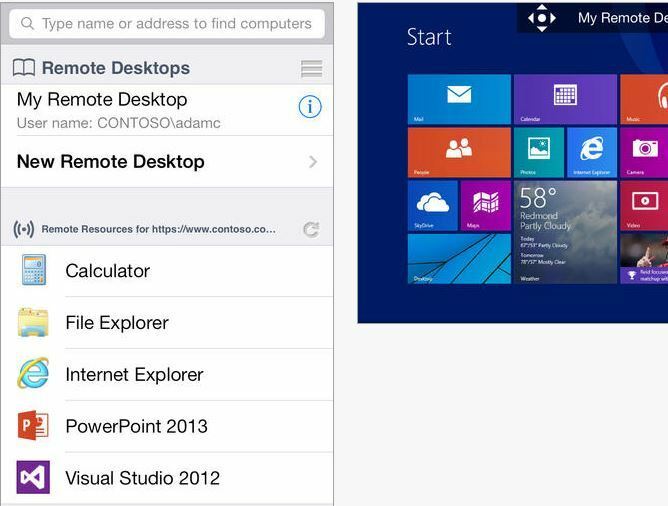 Microsoft also has its own remote control app available on multiple platforms, including iOS. 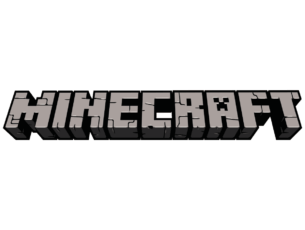 However, the app is only available with Server and Professional versions of Windows so if you’re using a different version, you should look for another solution. To set Microsoft Remote up on your computer, you need to install the RDP assistant on your Windows PC. Once you install the assistant, it will do the work for you. To set up Microsoft Remote on your computer, you need to install the RDP assistant on your Windows PC. Once you install the assistant, it will do the work for you. 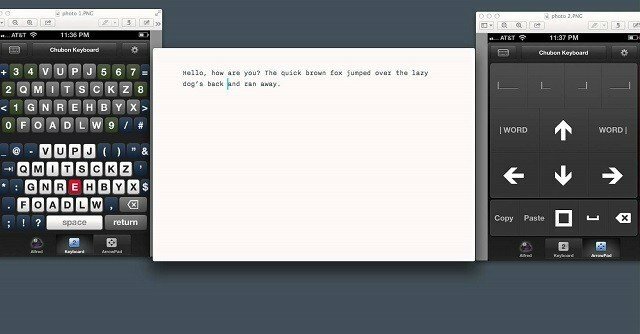 The app projects your computer screen on your iPhone. Once you’ve set up everything, getting around is quite easy. Microsoft Remote allows you to basically do anything with your computer as if you’re really using it. There are some additional handy options, like a magnifier and an on-screen keyboard. All these features can be initiated from the user interface. The app also supports multiple connections, so you can control more than one PC at the same time. Microsoft Remote is available in the Apple Store and you can download it for free. 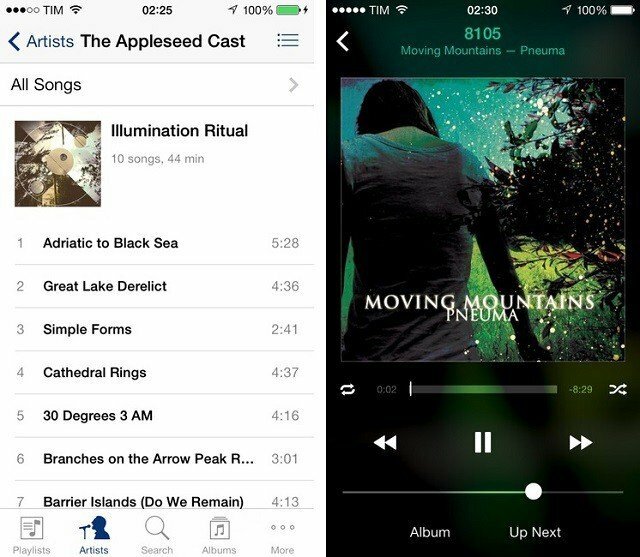 HippoRemote Pro is another versatile, feature-rich remote control app for iPhone. Of course, the app is compatible with Windows, but it also allows you to remotely control Mac and Linux. The app is multi-functional. It serves as a virtual mouse/keyboard for your computer but also allows you to control various apps. Many apps like Boxee, Hulu Desktop, various web browsers, iTunes, and more are supported. So, in case you need to control a particular app, you don’t need to bother using a regular virtual mouse and keyboard. It also contains a gaming mouse feature to control your favorite games. Additionally, the app is also compatible with various online services and sites. For example, it allows you to check your Facebook or post tweets. HippoRemote Pro is available in the Apple Store for $4.99. There’s also a Lite version available for free. Mobile Mouse Pro has one clear purpose. This is one of the best apps for simulating touchpad and keyboard on your iPhone. So, if you just need to control your Windows PC from the comfort of your couch, Mobile Mouse Pro is the best option. Mobile Mouse Pro has a couple of connectivity options. You can connect it via WiFi, or Bluetooth. Additionally, in case your mouse doesn’t work, you can connect it via USB and use a virtual mouse instead. The app also offers some additional options, like volume control, a numeric keyboard, the ability to set hotkeys, multi-touch trackpad, multi-language keyboard and more. The app is compatible with any Apple device, including the iPhone, iPad, and even the Apple Watch. Mobile Mouse Pro is available in the Apple Store and you can purchase it for $1.99. 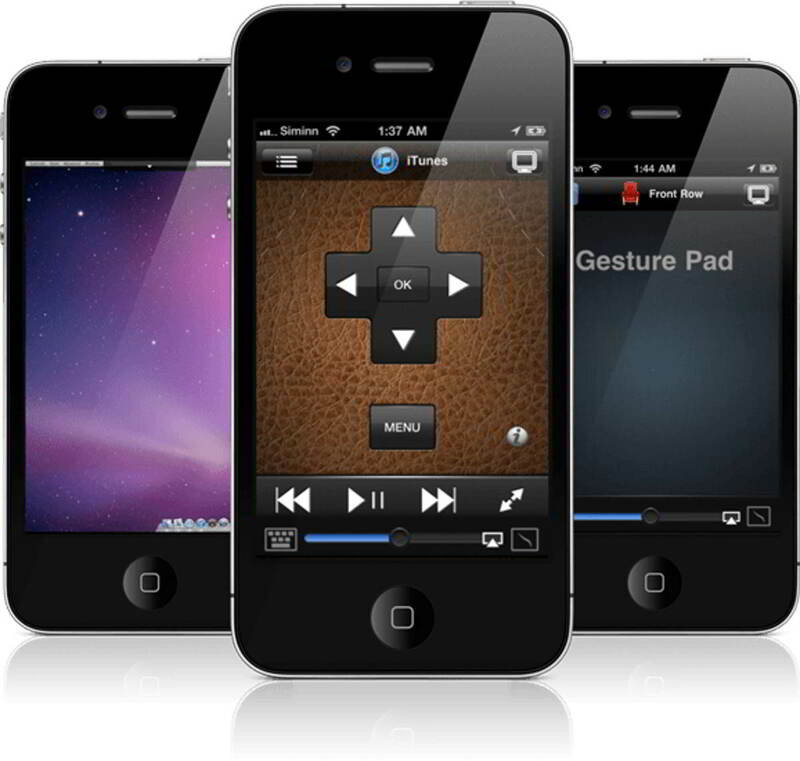 iTeleport Remote is one of the most advanced remote control apps for iPhone. However, it comes with a high price, so we assume only business users will be interested in purchasing it. This app features probably everything you’d want from a remote control service. There are some standard features, like the ability to control your computer via WiFi, 3G, 4G/LTE networks. You can connect up to 20 computers to iTeleport, and the connection will remain amazingly fast and reliable. Compatibility with software like Office, Powerpoint, Excel, Word, Photoshop is also available, so you can easily control these programs. VNC servers for Windows are available for free. 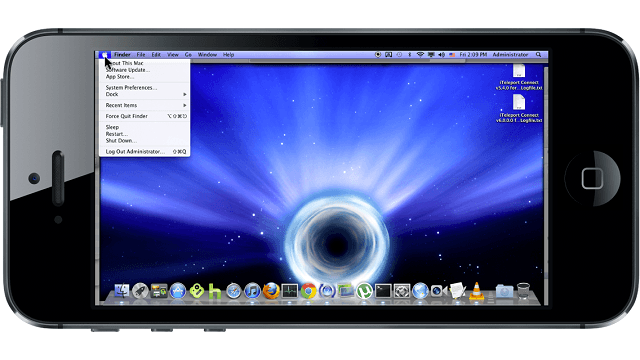 iTeleport also offers features like controlling media players, support for VGA out, the ability to wake up computers via LAN, and more. So, if you’re serious about controlling your computer from iPhone, iPad or iPod Touch, or your business simply requires the highly professional app, iTeleport should be among your first picks. You can purchase iTeleport from the Apple Store for the price of $24.99. As its name says, the main purpose of iShutdown is to allow you to turn off your computer remotely. So, if you don’t need fancy features, iShutdown is the simplest and the best app you can get. Besides the ability to remotely shut down your computer, iShutdown can also wake, put to sleep, restart or hibernate your PC. iShutdown uses WiFi and 3G connections to communicate with your computer. So, it’s a perfect tool to use if you left home and accidentally left your computer running. Establishing a connection between iShutdown and your computer is very easy. The app scans all computers in your local network, and you can turn off each one of them individually. Of course, the app must be installed on your computer, as well. iShutdown is available in the Apple Store, and you can purchase it for the price of $1.99. WiFiRemote is a great app solely for controlling your Windows PC with your iPhone. Even though it doesn’t support the screen projection, WiFiRemote offers a huge variety of features for effectively controlling your Windows PC. The most important feature is, of course, a virtual touchpad, with multi-touch support. There are also text pad and full feature landscape keyboard, for easy typing. Text pad is multi-lingual, as it supports Chinese handwriting recognition. Another interesting feature is a three-button accelerometer mouse. Using this feature, you can tilt your phone to move the mouse cursor on your computer. But this might feel awkward sometimes. The app automatically searches for your PC via WiFi, using the computer’s IP address. You can connect multiple PC, and control them all with this app. And finally, WiFiRemote has the ability to remotely turn off your computer, so you can use it for this purpose, as well. WiFiRemote is available in the Apple Store, and you can purchase it for the price of $2.99. 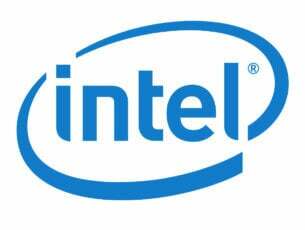 Even though iTunes is Apple’s service, aimed to Apple’s devices, there are millions of Windows PC users who are using it. Unlike Google and Microsoft, Apple doesn’t have its own app for controlling Windows PCs. However, there’s an app called Remote, that allows you to control iTunes on your Windows computer. Remote allows you to do basically anything in iTunes from your iPhone. You can browse the library, control the playback, see upcoming songs, explore shared libraries, and more. The app looks like a music player app for iPhone. This will give you the feeling that you’re actually using the original app. Remote connects with iTunes on your computer via the WiFi connection. Just install the app, locate your computer, and start playing music remotely. At the end of the day, we must say that it would be nice if Apple develops an app for remotely controlling the whole computer, but for now, iTunes users should be satisfied. Remote is available in the Apple Store, and you can download it for free. Jump Desktop is another advanced remote Windows remote control app for iPhone. It comes with numerous features, but also with a price higher than usual. So, if you’re willing to pay a good price for a remote control app, Jump Desktop should be in the conversation. This app offers basically anything you wish. It can project the computer screen, in combination with other features. It also has full mouse gesture and touchpad support, along with an advanced Bluetooth keyboard. The connection can be established through WiFi and 3G networks, so the app works fine wherever you are. Some of the additional features are: the ability to copy/paste text between devices, HDMI/VGA support, full support for Linea and Infinea barcode and MSR scanners, and more. If you’re interested in trying Jump Desktop, you can purchase it from the Apple Store for the price of $14.99. Jump Desktop concludes our list of the best apps for remotely controlling Windows PCs from the iPhone. Even though their purpose is similar, all these apps offer something different. So, you can pick the best one for you, according to your needs. Do you agree with our list? Or you know about some other amazing app we didn’t mention here? Let us know in the comments below.